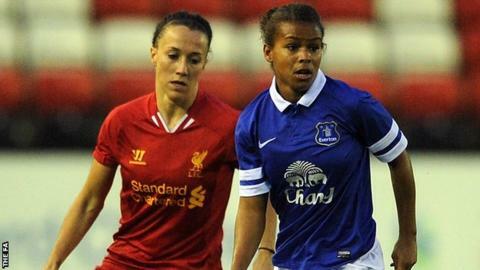 Everton Ladies will look to secure their second victory over Liverpool in the space of a week when the sides meet in the Continental Cup on Wednesday. The Blues shocked the Women's Super League champions by knocking them out of the FA Women's Cup on Saturday to reach the semi-finals. "Maybe people didn't give us any sort of chance," said Everton and England goalkeeper Rachel Brown-Finnis. "But we remain positive and I think we proved that on Saturday." Before the Women's Super League was created, Everton were a team who pushed Arsenal closest for trophies and beat the Gunners in the 2008 League Cup final and 2010 FA Women's Cup final. But with the increase in financial muscle and media interest in the game, the tide has turned on Merseyside and it was Liverpool who toppled Arsenal to lift the 2013 league title. "People will have spending power and they can use that spending power quickly," Everton manager Andy Spence told BBC Sport. "We haven't as a club and I agree with that. We've lost some senior players but in the background to that we've always developed players down the years. "Our philosophy hasn't changed. It's just strengthened our belief that what we've done in the past is right and it's standing us in good stead now." Liverpool transformed their fortunes from a bottom-of-the-table team to one that is full of domestic and foreign internationals, but the club are dealing with an injury crisis early in the season. "We were looking to build a squad of 18," revealed Liverpool manager Matt Beard. "We got to 17 but we've lost four players to long-term injuries and others have niggles. "We will be successful on a long-term basis, but in the short term we may have to alter our expectations a little. "I think with what we achieved last year, it's given a lot of other teams inspiration. If you have the right set-up you can achieve anything you put your mind to."